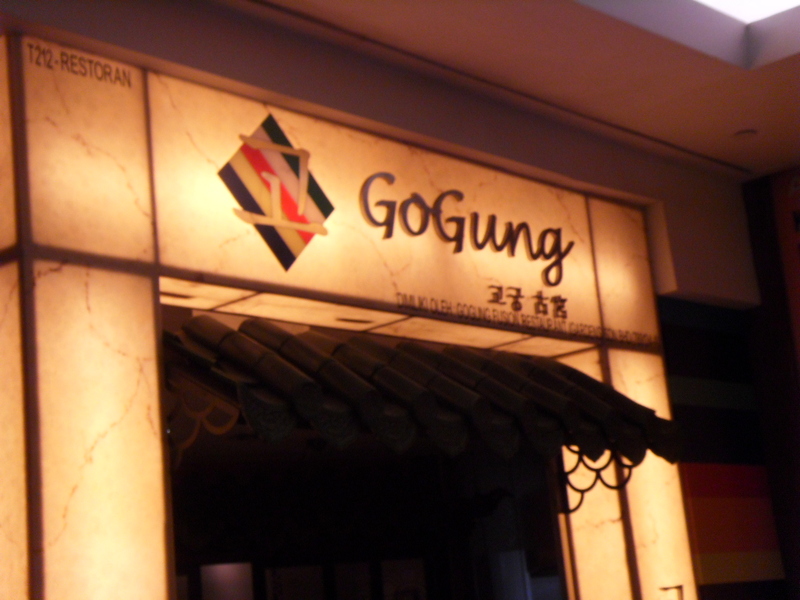 Go Gung – Gardens, Midvalley – You don’t need to know where. I am not writing this with much happiness or with glee. Today I was victim of discrimination and yes discrimination exists even in this world of food so called glorious food. This has never happened to me in other countries, no matter what food I choose to eat. This happened in my own country, at a place I always hang out and shop and eat. Go Gung!! Remember the name. It was Fiq’s birthday dinner and since we had Japanese the previous week at Hokkaido, and although I always like Japanese, I thought why not try something else. So the next best thing was Korean. So we walked around and stumbled upon Go Gung. I was a bit apprehensive from the outside, but then you know a lot of hidden gems can be found behind the walls and facades of something that does not look promising. Anyhow we peeked at the menu and since I was hungry I thought why not. 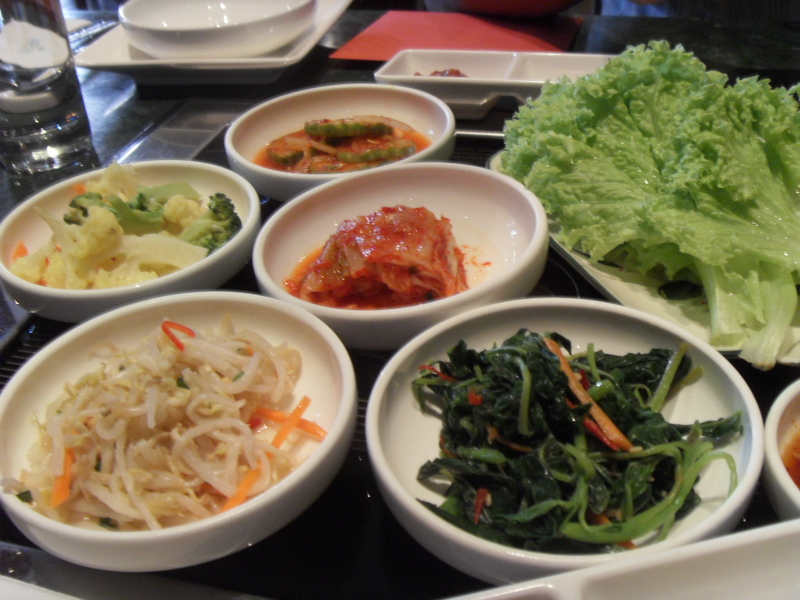 Frankly speaking I love Korean food, but I have never found good enough Korean food here in Kuala Lumpur. The prices are just shocking, and frankly the quality is always questionable to me. I guess after having Korean food prepared for me by Koreans and eating in Korean restaurants in Australia and knowing what is nice and all, and never ever been shortchanged, I try not to go to Korean restaurants in Malaysia, but somehow this year, I have had Korean food six times. From the beginning of April until now. I guess it has probably something to do with the fact that I have been quite tuned into Korean soapies. So back to my shocking story. I must add, the selection of Korean food here in Malaysia compared to Australia even in the 90s and is quite shocking. We have really nothing much here for some reason. So again… we were seated, we were the first people in the restaurant that evening. Dark, but quite inviting was the ambience. Now one reason I love Korean food is because they serve their little starters and I just love to pick. I have loved Kim Chi since I was a kid. And with the myriad little accompaniments laid before you, I can just live on that. Now this did not happen in Go Gung! We were served as pictured above, Kim Chi, Cucumber Kim Chee, Spinach, Bean Sprouts, and a Mixed Vegetable Medley with a Salad. Everything else that I am usually served was not there and when I innocently asked if that was all, I was told that it was all they provided TODAY on a Tuesday evening. I did think it was strange and asked again how come there were so few things and the waiter, a foreign import, said that was all that was prepared this evening. So ok, that was fine, if that’s the way it is then so be it. We ordered a bulgogi and I wanted something with vegetables so I was suggested to take the Bulgogi with Vegetables and I ordered a kim chi pan cake. So we picked at our little accompaniments and there was only five it finished fast and was replenished. I mean I enjoy my Anchovy Bok Um and Sausage Bok Um, and a few other things but ok maybe it was shop policy who knows. Then……. Three men walk in, and before they can even order, their accompaniments are served to them. And of course being the busy body I counted eight dishes. And of course being nice and positive I thought they were probably served two of the same things but then the sounds they were making with their chopsticks while picking their little morsels up was different. And a bit of head raising in their direction, I noticed they had more things then us. They had the mayonnaise salad, they had Kkomag which is cockles. They had a few thing we didn’t have. Now I am sure the waiters realized I was looking so they kept replenishing my accompaniments till I was all kim chied out! I was not happy. 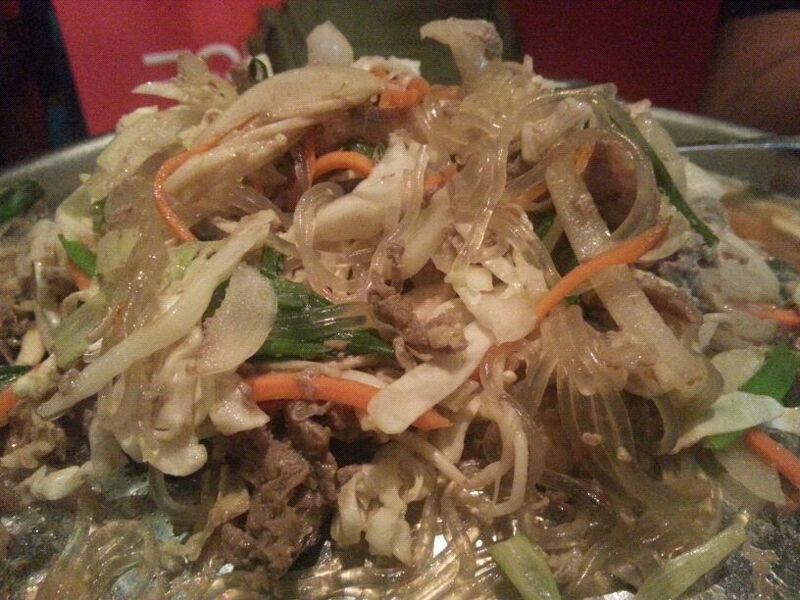 Our food came and there was more cabbage then anything else in our Bulgogi. The flavor was not rich, the color was not even right. While the meat was of the right quality. It was another upsetting moment. I love Bulgogi, I even make Bulgogi, the recipe is in my recipe book. And I get served this??? 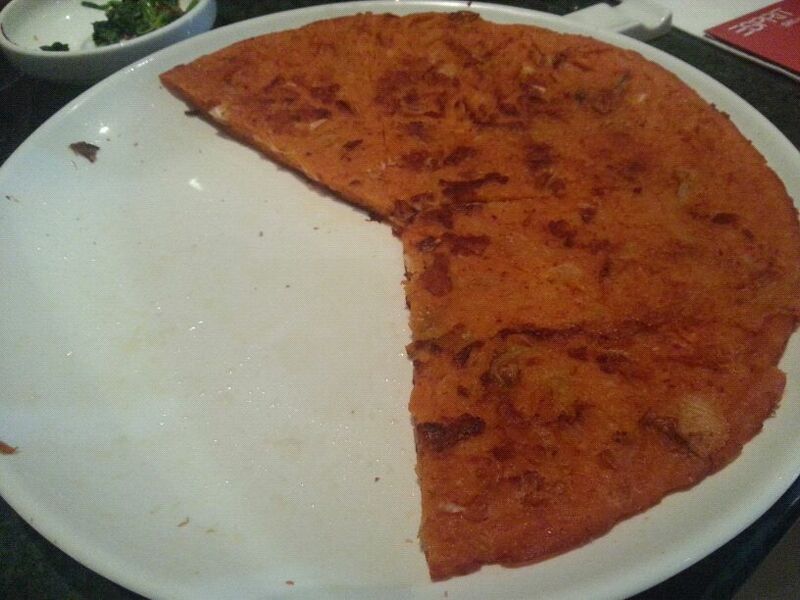 Then the Kim Chi Pancake was burnt! The underneath on one side was dark brown… I wanted to complain but Fiq was not the confronting type and it was his birthday so I kept my mouth shut! Go Gung is very lucky I didn’t take a photo of it. Why? They think they can served darker colored pancakes to darker colored folks? I asked a waiter that one day when I noticed my tim sum burnt. A couple came and sat exactly next to us in another booth. And guess what!!! They were served with more accompaniments then us, they had the mayonnaise vegetables which was so close enough I should have taken a photograph. They had seven or eight items. It is rude to stare you know. Hafiq paid… I think the look of disdain on my face was good enough for him to quickly take out his money and pay the waiter before I said my piece. What gets me most was the fact that because these workers were foreign imports, it would have been a waste of time arguing with them. I am sure the reason we were given less things was because of our ethnicity. The worst thing is, the people who served us were of the same color! Don’t ever think because some of us are not the regular kind to eat certain ethnic foods means we do not know how to eat it. I was eating Korean food when some of those servers didn’t even know where Korea was. GO GUNG! Kamsahamnida! NEVER AGAIN! This entry was posted in Uncategorized and tagged Discrimination in a Korean Restaurant in Malaysia, Discrimination in Restaurants in Malaysia. Bookmark the permalink. Thats really horrible!!!!! In The Netherlands a cust costomer is a costomer and they are treated simulair…………..Is there not a headoffice where you can complain? This is Malaysia for you. It is no point arguing with these foreign workers because they would not know what to do and they would be in bigger trouble if anything happened. It is not their fault I believe, I am sure they were told to do it. Thanks for sharing. Go Gung should be Go Crazy to you. If you and i were there, i think I probably wil not pay and confronting them on the spot. Muahaha. U should tell them u are food blogger with 60k supporters.I wonder how they react at that moment!